Kia are the second largest auto mobile manufacturer in South Korea behind Hyundai Motor Company. Kia means “rising out of Asia” in Sino-Korean which we believe is a perfect analogy for such a young company rearing its head with so many high quality vehicles. Amazingly, Kia didn’t start branching out into car production until 1974 which makes their current range of vehicles available to purchase quite an achievement and gives added strength to their slogan “The Power to Surprise”. Another fact that may surprise you, there is currently six models in the Kia defence range used by the South Korean military which include four by fours and large haulage trucks. Sales for Kia have been rising in Europe since 2002 when they released the new larger Kia Sorento which has proven to be very popular with UK drivers. In 2007, the new Chief Design Officer gave all new Kia cars a “Tiger Nose” styling which is designed the give the car a strong, recognisable face. Seeing as how Kia are fast becoming a very stylish brand as of late, this seems to be working well. Sticking to the winning formula, the 2014 Kia Sorento is even bigger and better. Kia might be relatively new on the scene but Britain loves an underdog. As a Kia owner, make sure you protect yourself with a Kia car warranty from Warrantywise. We guarantee not to be beaten on price and cover for any Kia car warranty. The Kia Carens is a mini MPV with a quirky yet lovable look about it. Kia put a lot of thought into the practicality of the Carens so there is plenty or storage space and leg room, not to mention a large useful boot and even plug in power sockets for your electrical goods. The Kis Cee’d was top gears reasonably priced car for quite some time due to its brilliant all round driving ability. Sharp good looks and masses of interior space make the Cee’d a smart little family car that all the family will love. The Kia Cerato looks beautiful and elegant as it streams along the road in a comfortable, classy fashion. Standard equipment in the Cerato is generous and lets you know that Kia are thinking about you in their work. The Kia Picanto is a modern, trendy looking car with plenty of spirit. Tiny size and a tight turning circle make the Picanto a perfect little city runner or first car. Fuel economy is also good so you wont be forking out fortunes the keep her running. The Kia Rio is a very smart little super-mini that offers brilliant space inside considering its class. Boot space is generous while handling and ride comfort are very refined. The deal clincher is the Rio’s diesel engines as some of them can deliver over 80MPG! The Kia Sedona is a very practical family 7 seater that is focused on interior space and ride comfort. It handles itself well for such a large, tall vehicle and the interior styling is very reserved and tidy as well. The Sedona is fantastic value for money. 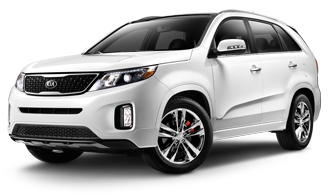 The Kia Sorento is a huge, muscular beast that offers practicality and spacious comfort in an aggressive looking format. The Sorento is responsible for Kias rise in European sales and is a fairly common sight on UK roads. The Kia Soul is a very trendy compact crossover that offers some entertaining options. You can have this Kia with various decals to personalise your Soul and the high drivers stance really gives the driver a good view of the road. The Kia Sportage is one of the best looking SUV’s on the market and its not just a pretty face. Very practical with plenty of space inside for legs and various objects. Of course as the name suggests, the Sportage can really move when you put your foot down.